Hey there, this is Daniel with Champion Industries and today we're going to take a quick look at the Prodigy touch-screen control panel that comes on our Pro 44 and Pro 66 Champion rack conveyor machines. What we wanted to talk about today is some of the cleaning and operational guides that are built right into the touch screen display. So lets take a look. We're gonna go ahead and click on the wrench up here at the top right. Down here in the bottom right it's going to show us our manuals that come with the machine. One is for operations and the other is for cleaning. This is a great feature for people who maybe haven't been trained by the representative or trained by the factory on these machines. It's all built right into the touch-screen display for new users and people who are going to be doing training on these machines a lot. So lets take a quick look at the operations; we're going to run through that really quickly. It talks a bout everything from your detergent, your rinse aid to drain the machine, closing the doors, everything is step by step for everybody to use. You can go through this in a little more depth when you actually get your hands on one of these machines and it'll talk about the cycle time, checking for final rinse temperatures to make sure we're sanitizing, down to how to stop the machine, open up the doors if there's any issues. So lets move onto the cleaning instructions. We're going to click on cleaning. Go ahead and start this instruction, it's going to instruct you to power down the machine, open up the drain to drain the tanks, open up the doors and then from here it goes into detailed instructions on all the different bits and pieces that need to be cleaned and how to go about doing it. This is great for re-training or training for the first time on staff that are going to be using these machines; to keep these machines up and running, to keep the service calls down, and to make sure you're getting the most out of your machine. Thanks for coming by and stopping in to watch this video. More to come from Champion. Have a great day. 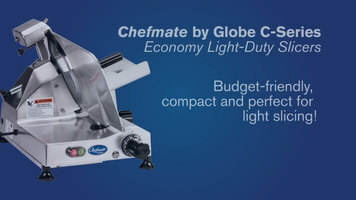 The Chefmate Series of slicers by Globe are affordable, user-friendly, and perfect for all your light slicing needs! 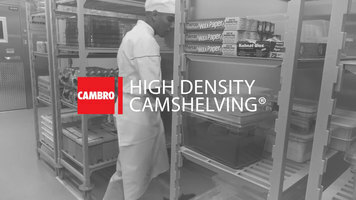 Maximize your storage space with the help of Camshelving® high density storage units! 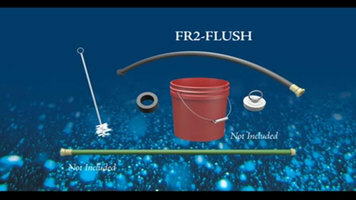 They're easy to install and allow you to keep back-of-the-house spaces organized for increased efficiency.